As midnight nears on Nochevieja, or “old night,” the last day of the year, Spanish revellers gather in front of their television screens or in their town squares, clutching a small bowl of green grapes and wearing red underwear. What’s it all about? 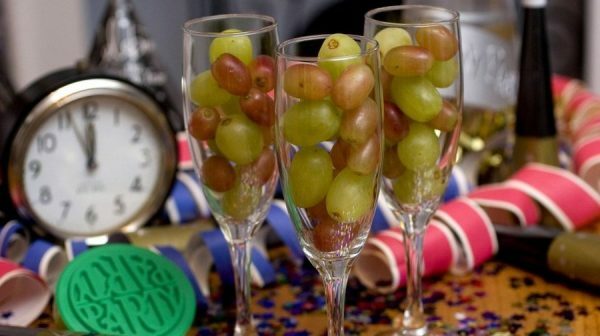 Well first the grapes, people are ready with 12 grapes and a glass of fizzy cava wine…. ready for a series of 12 chimes from the town / church bell – one for each month. On each strike you take a grape to the mouth and a swig of cava. Sounds easy? No no no … these chimes are in very quick succession… not many people can achieve this traditional task. The only way to finish all 12 is to not chew, just take a solid bite and then swallow, pips and all. If you eat all 12 by the end of the final bell’s toll – and that doesn’t mean finishing with a half-chewed mouthful – then you will have good luck in el año nuevo (the new year). To do so means a prosperous year and of course it’s good fun watching your friends and relatives gorging on grapes! This popular tradition is a century or so old, though its exact origins remain debatable. One oft-repeated story says that growers in Alicante had a bumper 1909 harvest and found a creative way to sell off their surplus! What’s interesting aside is that about 80 percent of the “lucky grapes” come from the valley of Vinalopó in central Alicante (indeed from the Hondon Valley areas) on Spain’s Mediterranean coast. Here in Hondon we know the delights of local grapes and the wine. They are fleshy, deliciously sweet, and pale, almost whitish-green in colour, they are a traditional Spanish variety called Aledo that, maturing late, are not harvested until November and December. Here in Hondon you will see them still growing in December as you drive around the valley. If scoffing grapes at midnight isn’t strange enough, convention says you must do so while wearing red “ropa interior”, or underwear – a bra, a sock, a garter, whatever. And stranger yet, the undergarment should be given to you by someone else. The local markets and stores usually have an assorted array of red underwear for this special occasion. Not sure you checks this attire out but some people take great delight in proving their underwear is indeed red in colour! All part of the New Year celebrations and a happy start to another year. Enjoy your celebrations or traditions wherever you are … peace and love to all. Previous Post: Hondon grapes? Excellente!